Published in Food Policy 26 (2001) 543–548. 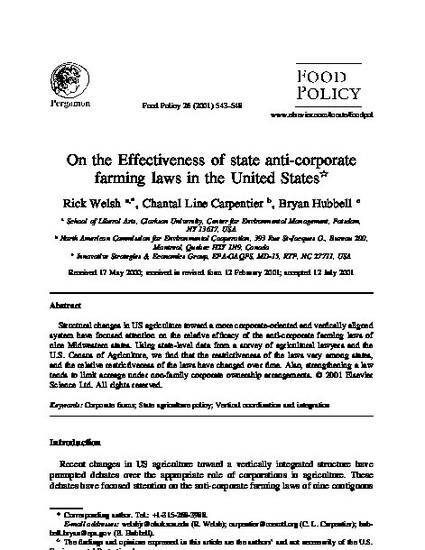 Structural changes in US agriculture toward a more corporate-oriented and vertically aligned system have focused attention on the relative efficacy of the anti-corporate farming laws of nine Midwestern states. Using state-level data from a survey of agricultural lawyers and the U.S. Census of Agriculture, we find that the restrictiveness of the laws vary among states, and the relative restrictiveness of the laws have changed over time. Also, strengthening a law tends to limit acreage under non-family corporate ownership arrangements.